Our bus came up a short hill, rounded the last corner and before us was a sign marking the entrance. The Island School! As we crunched and bounced down the pockmarked driveway lined with hundreds of conch shells, all 48 heads on board were swiveling from one side to the other and back again. To the left was a fleet of boats, to the right a huge wind turbine and straight ahead a cluster of buildings with blue roofs. The bus came to a halt halfway around a circle with a tall flag pole in the middle, flanked by two thatch-roofed gazebos. A moment of silence descended on the group and then was broken by a loud voice crying out from the entrance of what we soon learned was Boys Dorm. “TODAY IS THE GREATEST DAY OF YOUR LIVES!!!! !” yelled the man we came to know as David Miller as he ran, beaming, towards the bus. A chorus of nervous giggles was the response inside the bus. We learned later that night from Chris Maxey, “you are here to save the world.” This was the beginning of the Spring 2009 semester at The Island School. 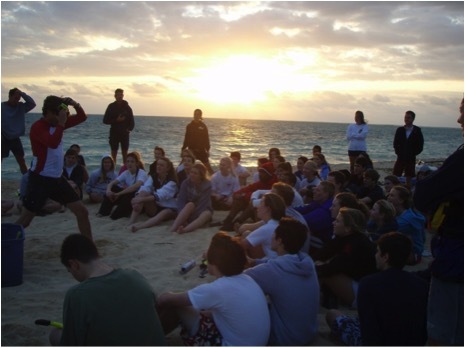 While at The Island School I learned that I could swim 4 miles in the open ocean, ooids can be studied for math class, how to drive a boat, use a sextant, conduct interviews with locals, and connect with people and places in ways I had not known was possible. I learned that Fritter is both a food item and an adored animal. That was the better part of seven years ago. The best part is even though it felt like a devastating ending when day 100 came and we had to leave the Island, it turned out to be just the beginning. For me, it turned out that the day I arrived on The Island School campus really may have been the greatest day of my life because I would not be where I am now without those first harrowing moments stepping off the bus into a new way of life. I know many alumni feel the same. After leaving, The Island School became as essential to me as my own heart. I received no greater reminder of that than during the summer of 2010. I woke up to the sound of feet clomping up the stairs outside my bedroom. As per usual, I rolled over and pretended to be asleep, hoping that my parents would have mercy on my laziness. My door clicked open and I heard a deep inhale of breath followed by a loud, drawn out note. This was a note which I had previously associated with only one place in the world. It had to be a dream I told myself, but I had to look just to see. I rolled over again and standing in the doorway to my room was Chris Maxey himself, brandishing a conch horn and preparing for another blast! I doubt I have ever leapt out of bed faster as Maxey hurried me down the stairs and out the door for a run-swim and yoga session along the Jersey Shore. That morning, Maxey taught me that I could leave The Island School, but that The Island School would never leave me. Maxey and Carter after the surprise run-swim. The Island School showed me that there was a life to create in my greatest interest. From the moment I left I knew I was going to be an environmental scientist. I came home convinced that I was going to change the world, that I had all the tools I would need to do it, and that I could start that very day. Needless to say, I set myself up for immediate failure and frustration. I couldn’t understand why it was so hard to change someone else’s opinion. Why couldn’t my friends recycle? Why couldn’t my town have a community compost? Separated from my friends and teachers I had made at the Island School, I felt lost. But slowly I learned to pace myself, to take success and progress in smaller chunks. Others in my semester had similar arcs of progress, and we encouraged each other to keep going. Eventually, everyone in my semester graduated into college. We had spread out across the country, but we were still Island Schoolers. We sought each other out at events like the 15th anniversary reunion in Boston or bumped into each other in chance encounters on a street. I attended Hobart and William Smith Colleges. I signed up for all of the environmental and biology classes I could during my first semester. My fervor and eagerness to continue my path to becoming an environmental scientist was, at the time, seemingly impeded by having to take a class called Storytelling, with a professor named Charlie Temple, along with my bio classes freshman year. Little did I know that one class would have a profound effect on me, to the point where I altered my double major in Environmental Studies and Biology to accommodate an English minor. I excelled when I could communicate with people instead of attempting to communicate with a microscope. This realization was a critical struggle that I wrestled with throughout college because I was so thoroughly convinced that I needed to save the world, as Maxey had told my semester years before, and that science was the only way I could do that. I finally found my answer only months ago. 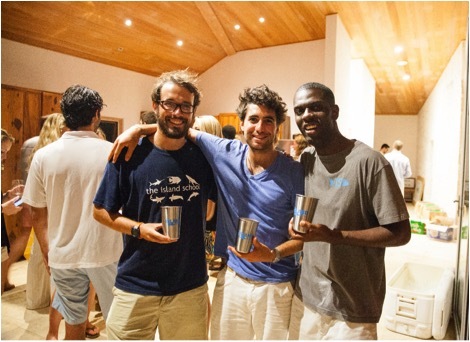 After graduating from HWS, I accepted a position as The Island School’s Alumni Educator which planted me for a full year back on Eleuthera. I was put in touch with all of the Class Agents from all semesters, while also being an advisor to a group of students. In many ways, it felt like I was completing a cycle and returning home. I coached swimming and freediving, helped lead community service and co-led a Down Island Trip. I spoke weekly with alumni from all over and turned their stories into blog posts. I even had a hand in the 2015 CONCHtribution and 2016 1-for-100 campaigns. To top it off, I had two advisories of my own filled with the most incredible students. At the end of both the Fall 2015 and Spring 2016 semesters I received a letter from an advisee that brought me to tears because of the writing’s elegance and simple beauty. Those letters showed me that I had made a tangible difference in at least two lives. My advisees taught me that there are an infinite number of ways to change the world. Freed from the burden of a destiny I had shackled myself to, I am now a fundraiser at a medium-sized environmental charity in Philadelphia. Professor Temple from my Storytelling class five years ago might be proud to know I tell stories for a living. And each day I get out of bed as if Maxey were in my doorway, with a conch horn, telling me to do my part in making this world a better place.